Plastic business card boxes are one of our most popular products! Manufactured from clear, shock proof, recyclable polypropylene. Business card boxes are stocked in huge quantities for guaranteed next day delivery. 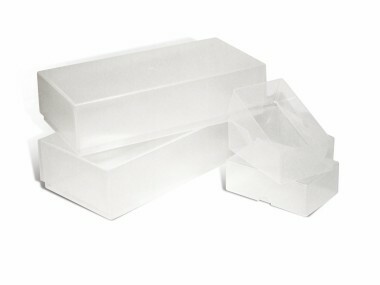 Plastic business card boxes are a very economical and environmentally friendly method for packing and presenting cards. Internal dimensions 97mm x 60mm x 35mm, pack sizes 100, 500 or 1000. Great discounts for bulk orders! Also available in double depth and 1/3 A4 sizes.